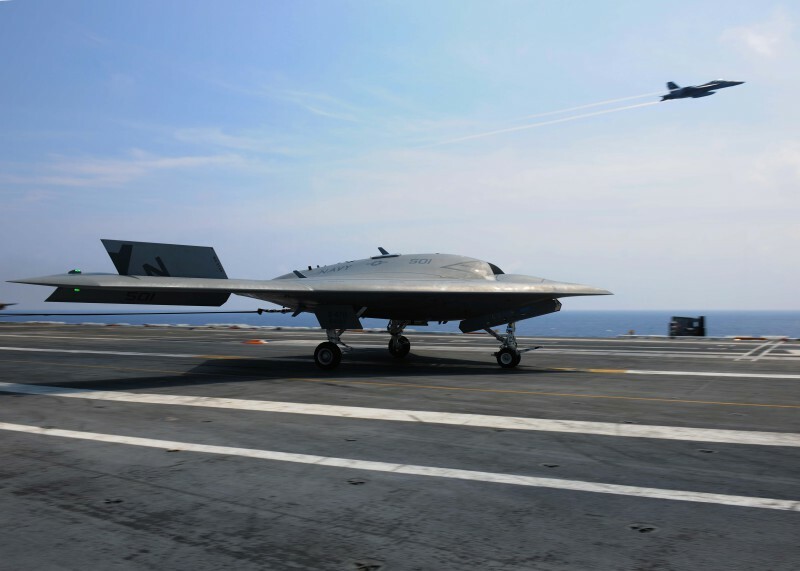 USS THEODORE ROOSEVELT, At sea --- The Navy’s unmanned X-47B returned to carrier operations aboard USS Theodore Roosevelt (CVN 71) Aug. 17 and completed a series of tests, operating safely and seamlessly with manned aircraft. Building on lessons learned from its first test period aboard TR in November 2013, the X-47B team is now focused on perfecting deck operations and performing maneuvers with manned aircraft in the flight pattern. The first series of manned/unmanned operations began this morning when the ship launched an F/A-18 and an X-47B. After an eight-minute flight, the X-47B executed an arrested landing, folded its wings and taxied out of the landing area. The deck-based operator used newly developed deck handling control to manually move the aircraft out of the way of other aircraft, allowing the F/A-18 to touch down close behind the X-47B’s recovery. This cooperative launch and recovery sequence will be repeated multiple times over the course of the planned test periods. The X-47B performed multiple arrested landings, catapults, flight deck taxiing and deck refueling operations. “The X-47B’s air vehicle performance, testing efficiency and safety technologies and procedures developed and tested throughout the program’s execution have paved the way for the Navy’s future carrier-based unmanned system capability,” said Rear Adm. Mat Winter, who oversees the Program Executive Office for Unmanned Aviation and Strike Weapons. The X-47B will remain aboard CVN 71 for the duration of the underway period. It will perform additional cooperative deck and flight operations with F/A-18s and complete night deck handling and flying quality evaluations. Recently, I was asked to share my thoughts on the upcoming X-47B detachment aboard USS Theodore Roosevelt (CVN 71) as we prepare to demonstrate limited integration of an unmanned system into the carrier air wing. So here I sit at my dining room table, with a cold beverage in hand, considering what impact this has on the future of naval aviation. grew up around aviation. While some kids went fishing with their dad, I went flying with mine. It is not lost on me – as a guy with the throttle in his left hand and the stick in his right – that in the future there might be fewer of us hurtling off the front end of a U.S. warship. I do lament the future loss of those moments that makes the job worth doing for free, like the most beautiful sunsets you can imagine created just for you; but my nostalgia is not an acceptable reason to hold back progress. As a single seat F/A-18 pilot I can attest there are missions in which we use the Hornet because it is the only aircraft available to accomplish the task, regardless of whether it was optimized to do so. An unmanned system is better suited for some missions, like persistent ISR&T, certain deep strike missions and CVN-organic tanker evolutions. When an F/A-18 is used to accomplish these tasks we consume service life of a very costly weapons system in execution of a mission outside the core set. As a tax payer I bemoan wasting service life on a $60 million F/A-18 for tasks which could be accomplished at lower cost by an optimized platform with a cheaper lifecycle cost. As part of the “Salty Dogs” from Air Test and Evaluation Squadron 23 (VX-23), I am privileged to serve as X-47B’s government flight test director. This has given me the chance to provide a pilot’s perspective on developing the concept of operations for this upcoming event that will shape the future of naval aviation. In a few days I will fly our squadron’s F/A-18 Hornet 90 seconds behind the X-47B in the carrier recovery pattern. From the cockpit, I’ll watch the X-47B make its way back to the ship, with full confidence that it will land with accuracy and precision as good as what I will execute behind it when my turn comes. It will provide me great satisfaction to see the X-47B raise its hook, fold its wings and be taxied out of the landing area providing me a clear deck to recover my F/A-18. The X-47B Integrated Test Team has been burning the midnight oil for months planning and practicing to accomplish this task. They are a group of the finest Americans with whom I have had the opportunity to serve. I raise my glass to them, the future of naval aviation, and the fact that unmanned systems will be part of ever more effective combat capability.